Photo of domestic appliance partly developed at City is a runner-up in a competition organised by engineering charity Practical Action. 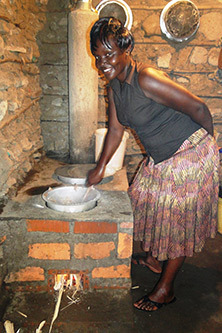 In a recent photographic competition organised by engineering charity Practical Action to demonstrate the impact of technology in developing countries, a photo (below) involving the use of the SCORE (Stove for Cooking, Refrigeration and Electricity) stove emerged as the runner-up. City was among four UK universities (the others were Nottingham, Leicester and Queen Mary) participating on the SCORE project, together with engineering charity Practical Action. The SCORE stove works by converting heat energy into sound and then into electricity, providing an affordable, versatile domestic appliance that can be used in the world's poorest communities. Though sound waves can also be used to generate low temperatures useful for refrigeration, this was not a feature of the research project. The stove is the product of the SCORE research project which is aimed at significantly improving health, quality of life, economic growth and social and educational opportunities. The project also aspires to understand the energy needs of rural communities. Professor of Energy Systems, Professor Keith Pullen, who was City's principal investigator on the SCORE project said: "Smoke inhalation from cooking stoves is one of the greatest causes of death in developing countries. Engineering researchers at City are active in finding solutions to this problem among many other researchers in various parts of the world. The SCORE stove is a low-smoke cooking stove that generates electricity fuelled by burning biomass products using a thermo acoustic effect. The stove was designed using techniques developed at City by Ron Dennis, supported by the Engineering and Physical Sciences Research Council (EPSRC). As a world first, electricity was generated by means of a thermo acoustic engine in City's laboratories in 2011." "The installation and use of the SCORE stove in Kenya was facilitated by Practical Action's Vincent Okello and Teo Sanchez. This has transformed the user's quality of life by removing smoke and reducing wood usage due to increased fuel efficiency". For more information on Practical Action, please click here. To see all of the entries in the competition click here.